It’s 1915, but Bea ignores the war between England and Germany and thinks more of her ambition to be an actress. She meets attractive Oberon (Ronnie) Rossiter and they fall in love. Then white feathers are sent to Bea’s brother Alex, to her friend Tod and to Ronnie – calling them cowards – and they all enlist, facing death on the Front. Ronnie returns wounded and shell-shocked. Will Bea help him escape the Army and give up hopes of acting? This is the story of Bea’s journey from peaceful countryside to Zeppelin-bombed London and how she realises the real horror war but also, the power of love. This is an exciting story for children of ten plus, set in the Highlands of Scotland where Kirsty and Cat are both facing new lives. They face danger when they attempt to help Angus, a boy fleeing from war. This romantic historical story will be greatly enjoyed by young teens and adults. It’s based on a true story set in 1799. When Louisa is called “The Cuckoo’s Daughter” by a fairground gypsy, she is surprised and angry. Now sixteen, she has lived all her life on a farm with her foster-parents and family but they refuse to tell her the names of her real parents. She longs to find out who they were. Discovering a hidden miniature portrait, she wonders if it is of her mother, but she still meets a wall of secrecy. She falls in love with handsome Godfrey Macdonald but her foster-father refuses to allow them to marry and sends her to a horrible boarding-school. Will she be brave enough to escape the school and elope with Godfrey, leaving the only family she knows and the foster-sister she loves? And will she find out the truth about her real parents? It’s wartime Britain and Pip has been evacuated to the country where she meets a new friend, Harry, the girl at the farm. The war has touched them both. Harry's father has lost part of his arm and an eye at Dunkirk and Pip's father has fallen for someone else while serving abroad. But the girls have other concerns. There is a boy living in a remote farmhouse where the family are stigmatised by the locals as enemy aliens and possible spies. When bombs start to fall, an angry mob descends on them. A thought-provoking, compelling read with a highly topical theme of prejudice in wartime from this popular writer. “ ... I enjoyed this book hugely, and it shows a completely different view of the war, not to mention asking very important questions about people in wartime. A very good exciting read, quite unputdownable!" Identical twins, Charlie and Cass, have taken sides and quarreled when their parents split up and are staying with Gran for the summer holidays. Charlie explores the area, and in trespassing in the grounds of the local stately home, Cleremont Park, she starts to see ghosts. The ghosts always do the same thing and, as she learns more about the history of the place, it becomes clear that they are re-enacting events leading to an unsolved murder. She finds that she must work with her twin and seek to solve the disappearance of the present owner of the Park. - A new chilling murder mystery and ghost story from this compelling writer. "This is an engaging mystery that runs alongside a story of coming to terms with family break-up and trying not to take sides between mum and dad." "Griselda Gifford writes well and convincingly." "Unravelling the crime of long ago brings danger"
"... This book would be enjoyed by readers of eleven years and upward as there is plenty of a contemporary nature and may touch on their own experience, also happenings which are of more sinister and chilling nature that will keep them interested and reading"
"This is a creepy ghost mystery that shouldn’t be difficult for readers fifteen and older. Some strange things happen that you might not understand at first, for example, when Charlie puts on a ghost’s hat and becomes the ghost. There might also be some words about ghosts and British village life that you don’t know. The Silent Pool is a great ghost mystery that’s perfect for Halloween." "... spooky stuff all right, and if you like a really good mystery book, you are going to love this one." Francis has always dreamed of being a hero. When his family falls on hard times, he seizes the opportunity to help but gets tangled up in a web of deceit. When disaster strikes and he is surrounded by danger, it’s time to prove whether he really has what it takes to be a true hero. Sam and her family are on holiday at the Monkswell Guest House, and some very mysterious things have started to happen. Down in the cellar lies a monk’s carved box — undisturbed for centuries until now. Once it is opened, Sam is racing against time to discover the secret of Monks Island. Jo and her family have just moved to a cramped inner city flat. She is beaten up and abused by the bullies in her new school and her home life is just as difficult. Her little brother Doddy was rendered speechless in a car accident just prior to the move and her mother was also injured. anyone holding it the gift of second sight. Jo now has the power to solve her problems - but does she really want to use the knowledge that she gains? Fran is very upset because her mother has remarried and she has to live with her stepfather and his son at her gran’s old home. She was very fond of her gran, who has recently been found dead in the nearby river. Was her death an accident? Fran is sure someone is to blame and she’s determined to solve the mystery. Is the weird girl, Fay, who lives next door, hiding something? And why does another new friend, Denny, warn her against Fay’s strange magic? Fran faces danger when the river almost claims a new victim, before she finally unlocks its secrets in a surprising and exciting climax to the story. Forbidden a pet, Jo hides an abandoned puppy, Pan, in the allotment shed. When her parents find out, he has to go, but her friend Mitch takes him to the family boarding-kennels, the Doghouse. Meanwhile, Jo’s elder sister, Lyn, slips off with Andy and his friends, who spell trouble. Are they the vandals responsible for various local crimes? And who is leaving mysterious coded messages? Is the Doghouse in danger? When Bernie and her mum inherit Aunt Addie’s home, it seems too good to be true. But strange noises in a locked attic, followed by a visit from a mad old woman making accusations, don’t make for a promising start. Then a ghostly train crash begins to haunt Bernie. Could Aunt Addie’s dark secret be the cause? When Tim’s family is on holiday at the Macpherson house in the Highlands, he is surprised and angry to find Alan Macpherson so resentful towards him. But when Tim discovers the nature of Alan’s secret they join forces and become involved in a mystery that is stranger than either could have imagined. Tim keeps seeing a strange woman who is running in terror from someone or something. But who or what is it— and why can no one else see her? But the dramatic events are not confined to the children alone. Tara the wolfhound adopts Tim’s little terrier, Lucy, whilst Lucy adopts a wildcat kitten and saves its life.
" ... substantial in manner and content...well-wrought and personal prose." Clarence is lonely because he is the only white crocodile in a family of green ones. He searches the jungle until he finds a family of white crocodiles and makes friends with Emily, who is sad to be the only green crocodile in her family. They marry and have one green baby, one white and one striped. "If all crocodiles were striped, none of them would be lonely," said Clarence. Selina was tired of being the youngest in her family. The friendly old lady next door explained that being the eldest could be even worse. Later, when the old lady became ill, Selina showed she was not too young to saved her life. 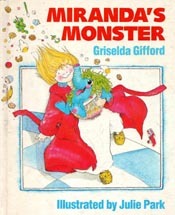 The baby monster had lost its mother, and Miranda takes pity on it. The Monster has some strange tastes in food, and soon presents Miranda with a HUGE problem! "The Little Dancer and other stories"
Mum said Jane could not have a puppy and Jane was sad. Later Jane found a white rabbit in their garden but mum said they must put a 'found' notice in the shop. What happened next? Did Jane manage to keep the rabbit? Well, ... sort of. Luke’s two Grans were as different from one another as chalk from cheese, and he liked both of them. But when they came to look after him at the same time then the problems really started! Who did he like best? Chocolate Gran or Jelly Gran? After the battle of Culloden, Ranald Macdonald and his family are forced to flee their homes to escape the barbarities of the cruel English soldiers under the command of ‘Butcher Cumberland’. With his father held prisoner in Carlisle, Ranald finds his former life, as a carefree young boy, must change if he is to protect and assist his womenfolk in their perilous quest for freedom. 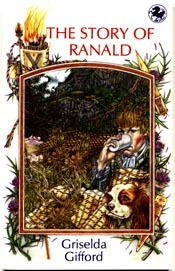 This is a true story based on Ranald’s own account written in 1749, two years after his escape. It gives a rare insight into how it must have been to leave a beloved home and country as a fugitive never to return.
" ... Based on young Ranald Macdonald’s own account of the journey, this human document is warm in every detail because it is written from the inside. ... their father is tried and executed as a traitor ... and their stepmother takes the agonizing decision to send sensitive, unsoldierly Ranald and his little sister Kattie into “exile” in Cumberland. This is living history, poignantly related by an author who has respect for source material and can keep it alive when translating it into fiction." “...most beautifully told, though intended for the younger reader, it is hard to imagine anyone not being affected by it. There are scenes..that have a timeless quality that live on in the imagination... "
"This narrative owes its excellence to a very sure historical imagination..."
What would you do if your leg was in plaster and you couldn’t climb down the rock face to help your two friends who were stuck — and there was an air raid warning? Or you found a cow on the line and there was a train coming? Or you longed to be a brave heroine, but people laughed at you because you were a clumsy, dreamy girl? Griselda Gifford tells what Pete and Dan and Elizabeth and some others did in just such situations. Here are seven stories about children having adventures and facing up to hard and difficult things which might be problems to many people. Two of the stories are set during the last war, and the rest take place in the present. This is a splendid collection which will be particularly enjoyed by those readers who like characters they can say are ‘just like me’. ...graceful prose that bears the impress of a particularly discerning eye on the doings of children and a discriminating taste in words...A book of quiet veracity and humour. The mitre that Em’s father buys when he is made a bishop reveals a magic quality. It will grant wishes made by its wearer. Unfortunately, Em and her father soon discover that wishes can easily get out of hand. Ten-year-old Vicky has moved to a new noisy town. She’s lonely until she meets Sandy, the boy from the Home. Together they form an animal rescue club to save Blunder, the dog next door, who seems to be ill-treated. Blunder is large and bouncy and it’s very difficult to keep him secret. Then the owner reports him missing and Vicky and Sandy are in danger of being accused of theft. Vicky decides they should run away with Blunder. It would be a great adventure, and anyway Sandy wants to try and find Uncle Alfred, his only living relative, whom he hasn’t seen since he was little. They set out full of confidence but soon find that running away has plenty of drawbacks. However, it’s too late to turn back—the police might be waiting to arrest them and send them to prison, and then what would become of Blunder? Griselda Gifford combines humour and sympathy in this entertaining adventure story.
" ... After many adventures which are told humorously and with sympathy, all turns out well with Vicky’s parents coming together in their common anxiety, Sandy finding his uncle and Blunder, the cause of it all – being adopted. Josh, Biddy and Sam cannot understand why the new lady in the top flat is so unfriendly. She goes out to work in the morning and comes back at lunchtime. She doesn’t speak to anyone. A little girl is left locked in the flat. She never comes out to play. Josh, Biddy and Sam are convinced that she has been kidnapped. But how can they rescue her? At the beginning of the school term, Cass befriends new girl Flora whom the other pupils laugh at because of her odd appearance. Despite her mother’s reluctance to let her ride, Flora reveals an unexpected talent with horses, and soon she is helping Cass to train her old pony, Silver, for a forthcoming horse show. Cass solves the mystery of Flora’s occasionally strange behaviour though several questions remain to be answered. Why won’t Flora talk about her father? Will Silver win an event at the show? And who is the strange man Flora meets there? When Cass’s baby brother falls seriously ill, Cass, Flora and Silver take desperate action and several mysteries are solved. Readers of Griselda Gifford’s previous novel, Cass the Brave, will already be familiar with the impetuous Cass, her more sensible twin Carrie and the rest of the Vicarage family. And new readers too will be delighted to make their acquaintance in this lively and entertaining novel for the younger age group. Besides being an exciting adventure story, Cass The Brave is an entertaining account of the life of an accident-prone ten-year-old with a new mother, a conscientious father, and a saintly twin sister to contend with. "... a quieter, more domestic tale but has acute observation of a ten-year-old’s feelings and actions which will ensure the involvement of the young reader. Griselda Gifford manages to produce a good story about and for real children while introducing deeper themes to give the plot more substance…"
"An exciting adventure story … gives a very entertaining and sometimes very funny picture of a mischievous child." The beginning of the summer the worst possible time to have your tonsils out, especially when all your friends are going on the Brownie holiday without you. At least, that’s what Jenny thinks, until she actually gets to hospital. There she quickly makes all sorts of new friends. The most important of these is of course Mirabelle, the girl in the next-door bed. She has a special secret which she promises to tell Jenny after the operation. But Mirabelle is sent home before she can tell and no one seems to know her address. By now Jenny has forgotten all about the Brownie holiday. She has to find out Mirabelle’s secret, and as soon as she leaves hospital she sets out to do a bit of detective work on her own. The story is illustrated with line drawings by Jael Jordan. "Jenny has to have her tonsils out and at the hospital she meets another little girl, Mirabelle. After their return home, they eventually find one another again, and Jenny is able to join in the display given by Mirabelle’s dancing class which was her’secret’. It is a straightforward story of life in the less prosperous part of a cit but the characters and events are treated with great insight. I particularly liked the description of the noise and apparent confusion of a children’s ward, seen from the patient’s point of view." Jake didn’t want to go to Brightsea School. He didn’t want to live in Brightsea, for that matter—especially without Dad—and he was furious with Mum and drippy old Seabag and just about everyone else he could think of. He soon found that the only other new boy in the class hated Brightsea just as much as he did, and together they plotted revenge. Adiz was a difficult friend to have. He seemed so fearless and determined, and had such good ideas that Jake had trouble matching them. Indeed, just the thought of what they’d planned for Sports Day made him feel ill. This funny, thoughtful school story is complemented by Jill Bennett’s marvellous line drawings. All the Taylors had measles, except Ben. With his brother and sister in bed with measles and his mother far too busy minding them to bother much about him, it was not long before Ben had his great idea: he would go on an Expedition down the river. The first thing was to build a raft, which turned out to be more complicated than Ben had expected, but even when he had managed to get afloat the Expedition still went rather wrong and Ben found himself having to apologise to Colonel Hardy for some damage he really hadn’t meant to do. But in the end this turned out to be a stroke of luck, for the Colonel knew all about Expeditions, and soon Ben, the Colonel, and the Colonel’s large and useful Great Dane were well on their way to making an exciting discovery. ‘ ... beautifully printed with the kind of black-and-white illustrations that somehow look as though they were coloured; a gentle story of Ben’s expeditions down the river…' . All Sue could see from the window of the basement flat where she lived with her mother were two dustbins, a stone wall with railings at the top—and the legs and feet of the people walking past. One morning Sue saw something very odd. Two sticks were walking along the pavement and just behind them were four furry paws, followed by the wheels of a tricycle, two small feet in very dirty sandals and a ‘rope’ which suddenly twitched at the tip. Solving the mystery of the wooden legs brought Sue some much-needed friends and introduced her to the exciting life of the circus. ‘Griselda Gifford’s first children’s book was The Youngest Taylor (see below). Her second book has that same sense of fun and shows the same understanding of children. She joins the Acorn Library with a winner. The youngest and quietest of the Taylor children is Hen. He loves making plans and one summer a book he has been reading gives him the idea of organising the escape of two small, unhappy schoolboys he has seen behind the railings of the boarding school in the village where the Taylor family live. Ben keeps his plan a secret from everyone, creeping out after tea every evening to work. But his brother and sisters will not leave him alone. His bouncy sister Tigger is always starting quarrels which usually end in an evening ‘curfew’ for all the children, and his other sister Ann badgers him for help with her plans for rescuing stray or neglected animals. Ben finally has to play truant from his school so that he can complete his project and start the rescue of the escaping prisoners, who suddenly become unexpectedly reluctant and uncooperative. The great escape ends with a hunt across the countryside in which the village policeman, the headmaster, a donkey, Ben’s mother, and his elder brother Simon’s extraordinary invention all join in following Ben’s carefully-laid secret trail. This is Griselda Gifford’s first book. She writes with a gentle and affectionate sense of humour and a shrewd insight into the problems and frustrations of being the youngest in a family.
" ...This story is as much about the elder brothers and sistrs as about ten-year-old Ben, and Miss Gifford skilfully sketches in their characters and records their quarrels with an accuracy that makes one wince…"